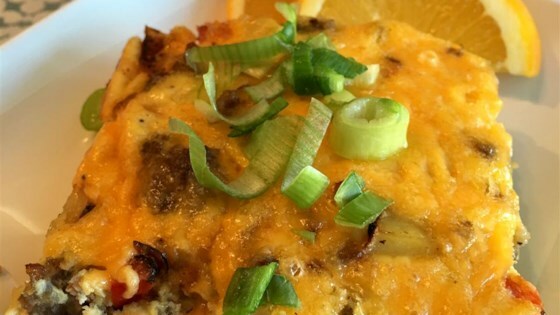 "This is a breakfast casserole perfect for curing any degree of hangover; also perfect for brunches and potlucks!" Preheat oven to 350 degrees F (175 degrees C). Grease a 9x13-inch casserole dish with cooking spray. Heat olive oil in a large skillet over medium heat. Add potato and onion; cook and stir until potatoes are golden brown and soft, about 10 minutes. Place chorizo in a nonstick skillet over medium heat; cook and stir until browned and crumbly, about 5 minutes. Whisk eggs with milk in a large bowl. Add red bell pepper, cooked potato and onion, and 1 cup Cheddar cheese to the egg mixture; pour into the casserole dish. Sprinkle 1/2 cup Cheddar cheese on top. Bake in the preheated oven until firm and cheese is melted and starting to brown, about 30 minutes. Cool before serving, about 10 minutes. What a great way to feed a hungry breakfast crowd! Worst breakfast casserole ever...and I followed it exactly.